Toll-free number 1800 1800 235 for PMJDY Grievance Redressal System | Banks to ensure that Bank Mitras are deployed with inter-operable RuPay and AEPS compliant devices. | Time period for eligibility of Accidental Insurance Scheme by swipe of Rupay Card in respect of PMJDY accounts has been extended from 45 days to 90 days. | Banks to ensure seeding of Aadhaar in all PMJDY, DBT linked and pension accounts. | Banks to focus on seeding of mobile numbers in bank accounts in accordance with the RBI guidelines. State Level Bankers' Committees are formed in all the States / UTs in the country for inter-institutional coordination and joint implementation of programmes and policies by all the banks and financial institutions operating in the State. Responsibility for convening State Level Bankers' Committee (SLBC) meetings has been assigned by Reserve Bank of India to various commercial banks in conformity with the Lead Bank Scheme. The J&K Bank has been assigned the responsibility of convenor of SLBC in J&K state. SLBC meetings, held quarterly, provide for interaction amongst the various banks operating in the State on the one hand and between the banks and the State Government authorities / implementing agencies and concerned regulators like RBI, NABARD, etc on the other. The forum takes review of the performance of the banks/ developmental agencies under the Annual Credit Plan and also sorts out issues and facilitates removal of difficulties being faced in the implementation of various employment generating/ poverty alleviation schemes of the Government. 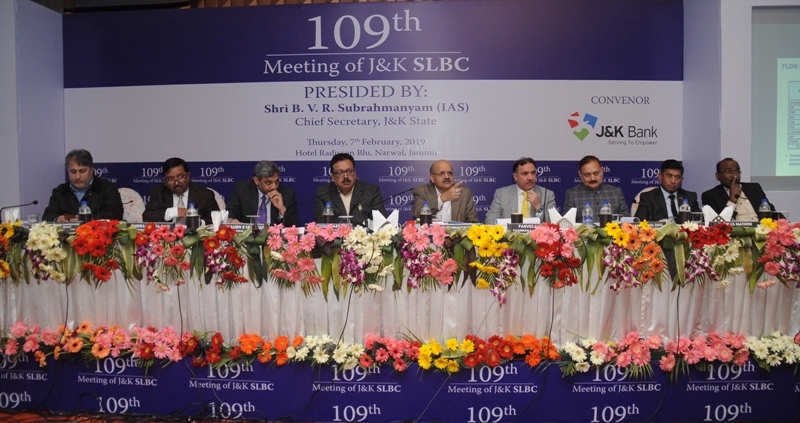 SBI happened to be the Convenor Bank of SLBC in J&K State till June 1983 and thereafter the Convenorship of SLBC has been entrusted to J&K Bank. Thus our bank has become the only Private Sector Bank in the country to be entrusted with the responsibility of Convenorship of State Level Bankers' Committee (SLBC) by Reserve Bank of India. The State Level Bankers' Committee (J&K State) is comprised of about 130 members including all the banks / financial institutions operating in the state, high level representatives from the concerned developmental departments/ agencies of the State/ Central Government, Reserve Bank of India, NABARD, etc. The meetings are generally presided over by the Chief Secretary of the State.